A great breakfast recipe from Eggrecipes, a quick, easy but amazing recipe. There is enough to serve the family and only 328 calories per serving. For more amazing Egg recipes, check out their website. Sift the flour and salt into a large bowl. Beat the milk with 1 egg and add to the flour, mixing to make a smooth batter. Brush a large non-stick frying pan with a little vegetable oil then drop 4 spoonful’s of the batter at a time into the pan and cook for 2 mins or until bubbles form on the surface of the pancakes. Turn over and cook for a further 1-2 mins. Keep warm whilst you cook a further 8 pancakes in the same way. Grill the bacon and black pudding under a hot grill to your liking. Wipe out the frying pan and add 30ml/2tbsp vegetable oil. Carefully crack in the remaining eggs and cook for 2-3 mins or until fried to your liking. 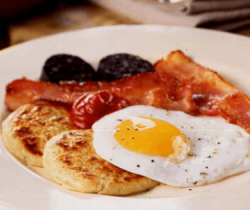 Serve the pancakes topped with a fried egg and the bacon and black pudding.